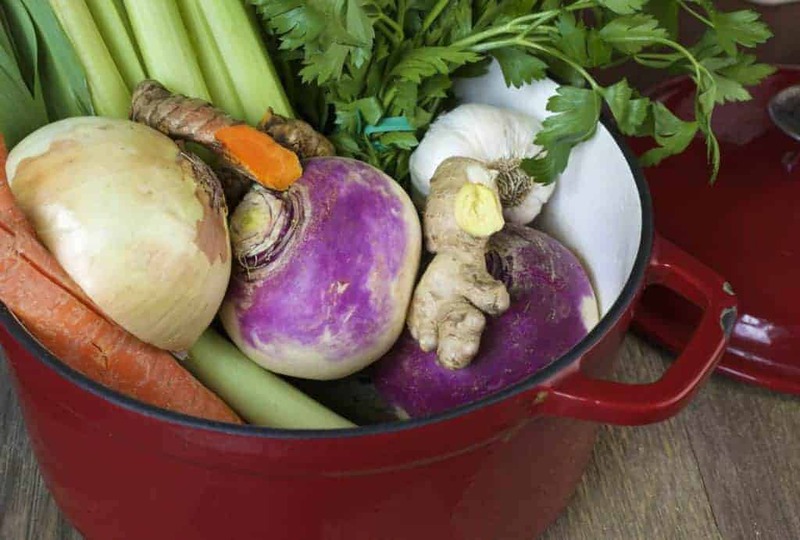 Learn how to make vegetable stock from scraps. 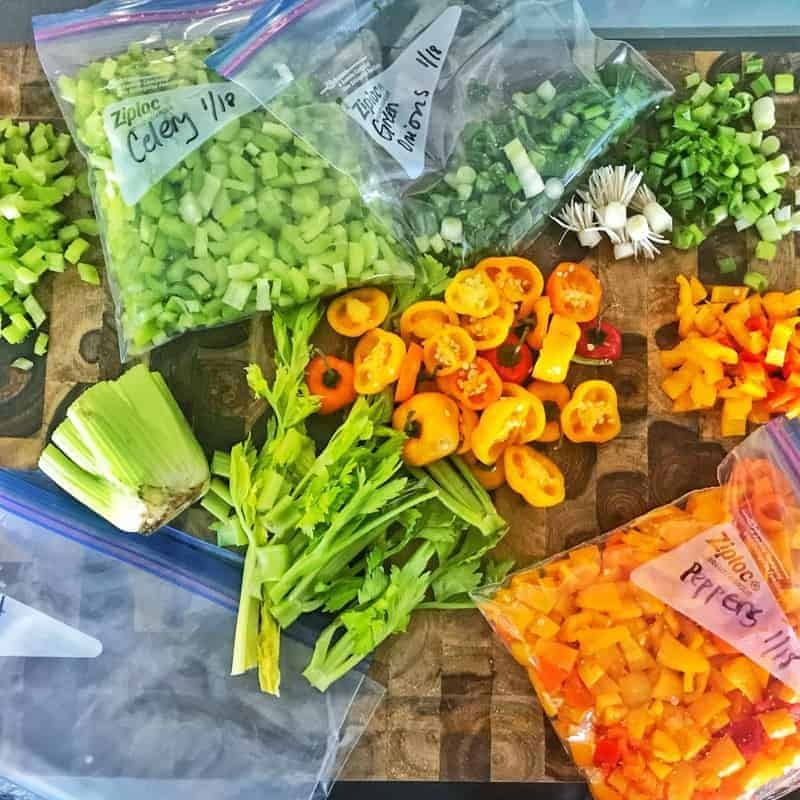 It’s a great way to save waste, save money, and add a lot of flavor to recipes! This week’s Mom Kitchen Tips & Tricks is about how to save & use vegetable waste. Why save waste? Because it’s a free way to add tons of flavor and nutrition to homemade broth or stock. Saving vegetable waste is easy. 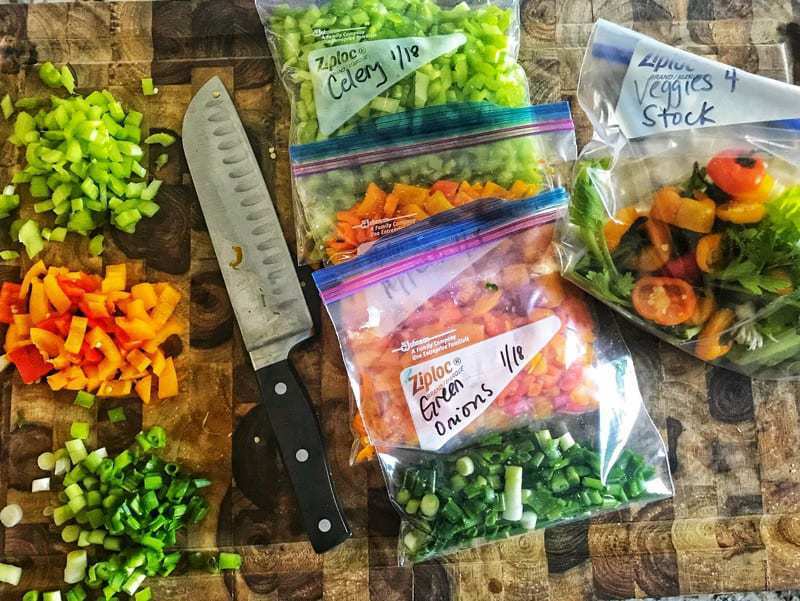 Simply label a gallon sized freezer bag and start adding the waste of veggies you don’t use. Typically, you use 1-2 stalks of celery in a recipe. I suggest chopping it all, then freezing it for future recipes. Once you freeze celery, you will lose the crunchy texture. The texture is due mainly to the water content of this veggie. Freezing ruptures these cell walls, losing the crunch, but the flavor remains perfect for use in cooked recipes and soups. 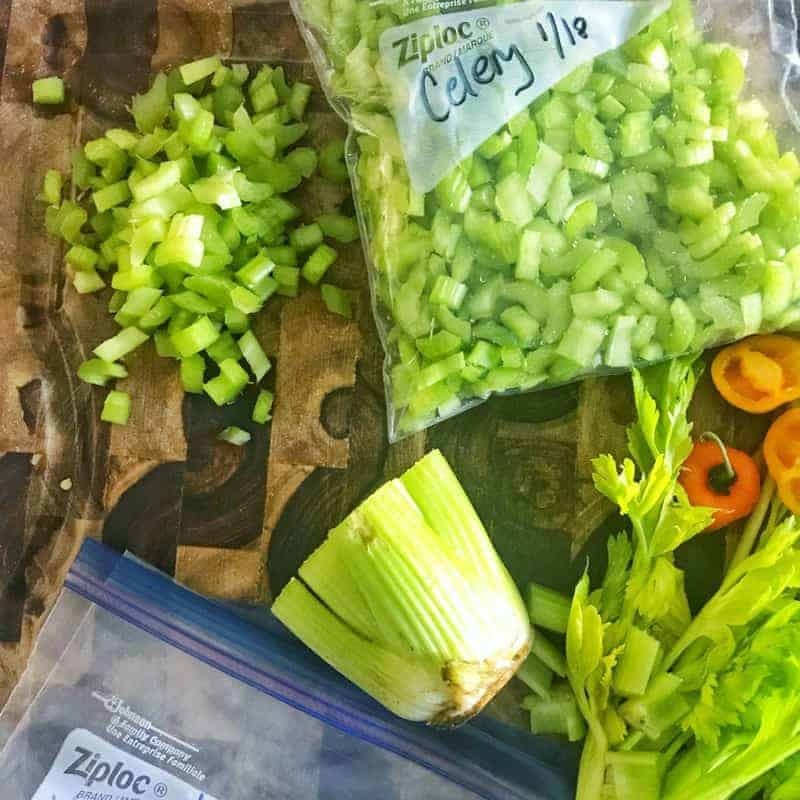 Take parts of the celery bunch that you won’t be chopping, like the bottom and the leafy middle pieces, place them into the freezer bag labeled for stock. Same with the above peppers. 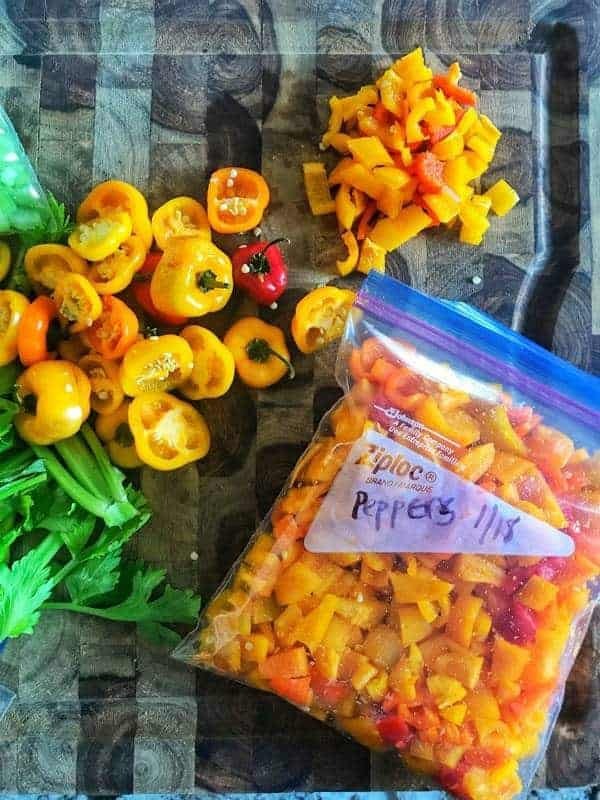 Place the tops into the freezer bag, freezing chopped peppers for later use in cooked recipes. 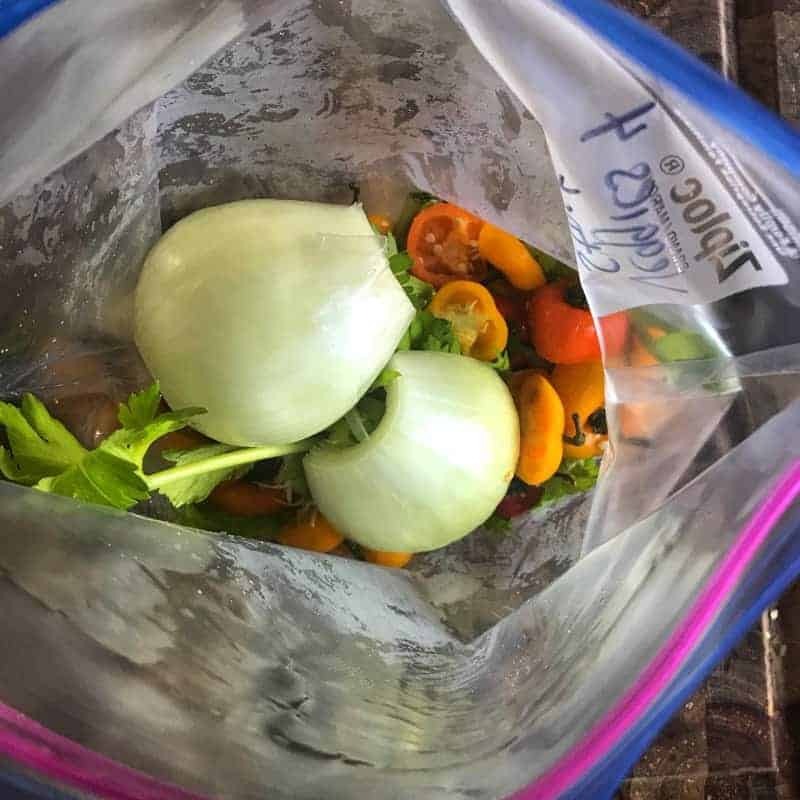 You can pull the bag out of the freezer at any time to add more veggie “waste” to the bag. Once you have the bag full, you are ready to make stock! You can freeze the chicken carcass from your roasted chicken dinner? The bones and leftover meat make a wonderful chicken stock! How Do You Make Vegetable Stock From Vegetable Scraps? Easily! 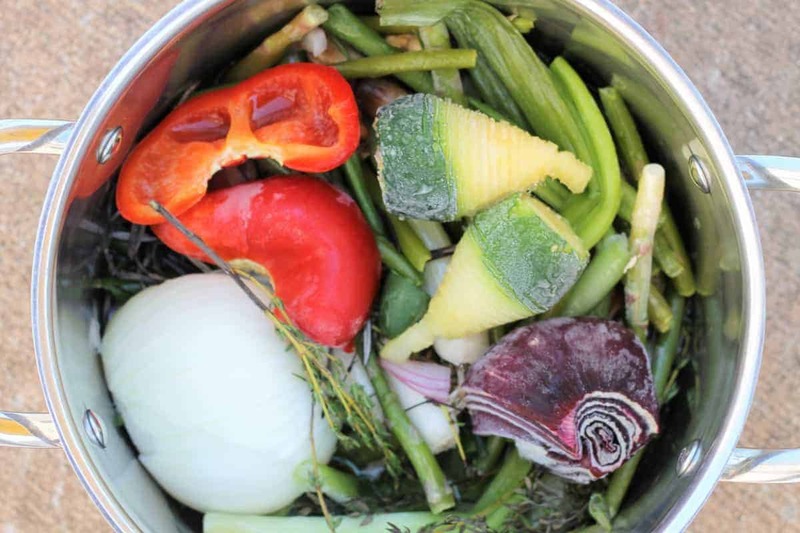 Add the vegetable scraps to a large stockpot. Cover with water. Season with salt, pepper, and herbs if desired. Simmer for 45 minutes- 1 hr. Pour through a fine-mesh sieve. Discard vegetables, store stock in an airtight container. Keeps 3-4 days in the refrigerator or freeze for up to 12 months. So what’s the difference between broth and stock? Broth is generally seasoned, stock is not. You can read more on this topic HERE. If you’re looking for more direction, check out these recipes. Once you get the hang of it, no recipes are needed! Have you tried making your own stock yet? I’d love to hear about it! Do you have a Kitchen Tip or Trick you’d like featured? Email jodi@createkidsclub.com and let me know!